Expressing heartfelt sorrow for your loss and pain!! !Iwas feeling soooo happy that you where bring Ethan home lastnite,I was shocked and sudden to learn he went too his Heavenly Home! !My prayers are extended too you mom and dad,your lil warrior taught us all how too fight against the odds!! Bless you as you grief Ethan’s home going!! Prayers for Mommy and Daddy. Stay strong! My deep condolences to both parents no words can make your pain go away may your angel rest in peace no more pain no more suffering baby rest god arms!!! Your words are incredibly touching and show the kind of strength only Christ can give during such times. He is with you and He knows your pain. There is a purpose for everything in life, and even though you will miss sweet Ethan everyday, there will come a day when he will once again be in your arms, healed and whole. My heart aches for your loss. Rest in Paradise sweet angel. You are free from any and all pain. Fly alongside with all the other angel babies ♡ You are safe now. I had the opportunity to follow Ethan and learn more about his condition. I feel very sorry and from the bottom of my heart I wish God gives you the strength to Continue. I know deep in you your heartbroken but his in good hands and in a place of pain free. From up above he will be watching you guys and I’m pretty sure his very thankful for the parents God put him into. Ur son has been a lesson for us all. Your words bring wisdom that can only be given from up above. As a believer, I expressed my sadness to my “believing” mother and questioned God as to why he would put Ethan through this? (I don’t know you personally but the news impacted me greatly) However, my mother, who also lost a son, explained the exact thing you just wrote on your blog! Ethan’s story not only educated me on this horrible disease but taught me that for every pain we experience, there Is God who saw his son Jesus go through pain we can’t even imagine. Gracias Ethan porque eres herencia de Dios! And thank you for being selfless and letting us join you through this painful journey. Ethan captivated our hearts and he will never be forgotten! I look forward to the day we are in the Lord’s presence and I get to meet your Ethan in heaven, healthy, playing w/ animals and being next to our Lord Jesus!!! We will continue to pray for you, your beautiful wife and daughter! I can’t Believe Your Little Angel Is Gone, I Wish This Was A Dream. Am So Attached To Ethan, I Grew To love him in Such Little Time. He Was Born A Day After i Had My Baby Boy Rogelio, When I Found Out About EB, I Was Devastated, How Can Such A Little Baby Take So Much Pain, But i knew He Had To be A Angel Sent from God ! Each Day I Pray For Ethan Too Get More Better And Too Keep Fighting Until Our GOD Say it’s Time. I Wouldn’t Imagine that it would hurt me so much, But it As ! Ethan I Love you So Much I Hope Your Right Next Too Other Little Angel Looking Down On Your Mommy and Daddy, I Hope They Can Handle The Pain. I Know They Will Miss You Deeply Ethan. R.I.P. I’m soo sorry for your loss.. I can’t imagine the feeling of losing your son. But God is behind you. Your son is in a better place now, I know it may be hard and at times you may ask God why but put your faith and believe that ethan is with is Father now. He is in no pain, and is following his father. My heart goes out to you and your wife.. My church and I the house of salvation will take a moment to pray for yiur son and to give you and yiur wife peace to touch your hearts and take thepain away… just whatever you may do don’t blame Gob bring your self closer to him..
My heart is breaking as i read your courage words, saying I’m sorry seems like nothing….. God bless your family…..
I’m so sorry, I know that you guys are going through tough times, but God knew you guys would be the best parents to care and love baby Ethan. Your words really do touch the soul, and you’re correct God gave his only son for us. God Bless your family today and always. I am sorry for your loss. Thank you for sharing your faith. Pray for God to fill you with peace, strength that only He can give. You have a beautiful angel in Ethan. God bless. I’m sorry for your loss. May the peace of Christ be with you & your family. Stay strong. You are such a great father to your children. He will be looking down on you guys now & he doesn’t have to suffer anymore! May you and your family find the strength to put your heart at ease. Rip baby ethan I love you! You and your wife are wise beyond your years. I am proud of you both. Please pray together so that you have strength In God to get thru this as a family. My mom and my stepdad always prayed together and i think it made their marriage stronger. Baby Ethan touched my life and on one hand I was heartbroken to read that he was longer here. On the other hand, I am relieved that he is no longer suffering and is now in Heaven. I extend my deepest sympathy to you, his parents. May God hold both of you close to help with the loss of ethan and help to heal your broken hearts. Notc a doubt in my mind that God chose ethan to become a beautiful angel and to give ethan a brand new body, healed from any pain and suffering. 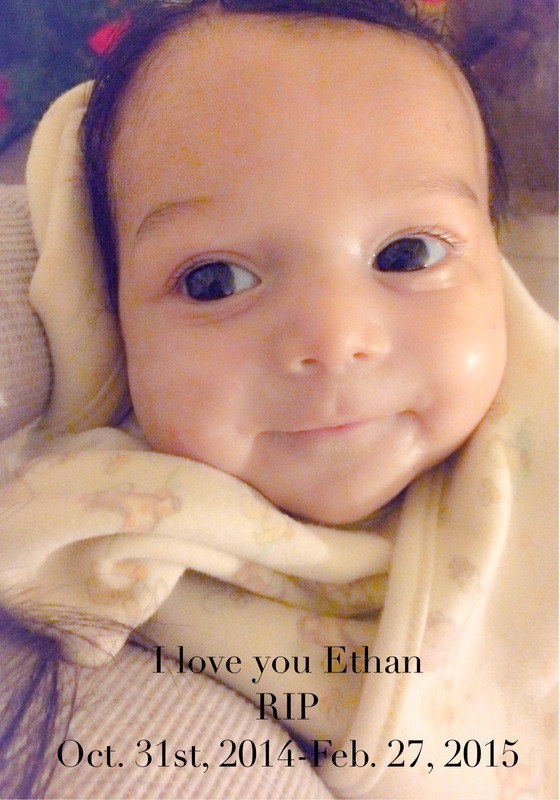 I feel God allowed ethan to stay with you both as long as he did so he could give you love to when he passed that both of you would become strong and help to educate people about this dreadful disease and allow research of eb to where in the very near future no other baby will never have to suffer or know the pain of eb. Your sweet boy shall be with you both each and everyday. I send you warm healing hugs and as I’ve done since ethans birth, i will pray for you and for all the research that will be done for a cure if eb. I’m so sorry for your loss. Praying for you, your family and Ethan. I’m sorry for your lost & I admire how strong you guys are being & how hard it is for you guys to talk about this but is also good for you guys to shares this information for us mothers that’s have small child . An I know there’s no words to describe how you feel but just know & have in your mind you guys did everything you guys could to save him & that his in a better place now & is watching over you guys. His your guarded angel now. God bless you guys! I have been following Ethan’s story and it has touched me a lot. This is a sad update! I was wondering the other day, when there will be news on Ethan again! He was very fortunate to be born into your Family! Parents who gave everything for him! I wish you all the strength and health you need at this time of grieving. You have an older child, too, right? Lots of love from some strangers from Switzerland! Let us know, if there is anything else apart from praying, that we can do for you! God knows how touched I am about your sons death did not see this on face book if so I would of kept up on your little angel. It makes my heart weep. I believe God only gives those people who can Handle it. That’s why you were choosen my prayers go to you for being so special. I am so sorry for your tremendous loss, Marcos (Jonathan) and Norma. I am glad Ethan was able to spend his final moments at home surrounded by your love. You both are amazing parents and people. You have touched so many of us at the hospital. God Bless. I pray for this Lil angel that leave a deep pain in my heart WHY this is happend then something cross to my mind God only give battles to the best soldiers and his the best I know .. I cry and cry Ethan you have all my respect and love and I hope one day see you smile in heaven .